Saif’s release was an obstruction of the court and those responsible would be prosecuted. The prosecutor’s office also said that the amnesty for Qaddafi-era prisoners passed by the House of Representatives (HoR) could only be enforced in compliance with what it described as “legal requirements and procedures agreed by the unquestioned judiciary”. Deputy prosecutor-general Ibrahim Massoud also pointed out that Saif is wanted by the International Criminal Court for war crimes committed during the 2011 Revolution. Massoud called on everyone to respect the prosecutor’s jurisdiction. He also insisted that its work had to be kept above conflict and political struggles. Both Zintan’s military and municipal councils have condemned Saif’s release on the “pretext” of the amnesty law. They said it betrayed those who had fought so hard and died to free Libya from conflict and corruption. The Western Command of the Libyan National Army (LNA) today announced the disbandment of the Abubakr Al-Saddiq brigade which freed Saif on Friday. No reason was given but the LNA said the brigade’s weapons and fighters would be moved to other units. Meanwhile, Human Rights Watch said Saif’s release “does not change the fact that he is wanted by the International Criminal Court on charges of crimes against humanity”. 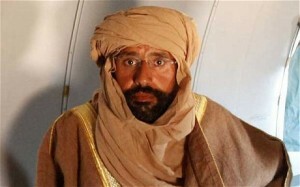 It described the amnesty law as “flawed” and reminded the Libyan authorities they remain obliged to surrender him. Uncertainty surrounds Saif’s whereabouts. Some reports say he is with former Qaddafi general Ali Kana and his Tuareg militia in the south – where there is still support for the old regime. Others say he is in Beida. His lawyer Khaled Al-Zaidi confirming his release, said he was in a safe town but declined to say where. Saif himself has yet to make any public statement and no one has reported seeing him. There is still some disbelief that he has indeed been freed. HoR member Abubakr Buera has questioned the authenticity of the news. He suggesting the release announcement could have been made for political gain. He pointed out that last year the Abubakr Al-Siddiq brigade claimed falsely that it had freed Saif. Buera said that if he had been release then it was a huge political mistake because Saif did not qualify for the amnesty. He insisted that former regime figures could only re-enter mainstream Libyan politics when the security situation had stabilised and a transitional justice system created.